Electric lamps finally lit up this small and little known village of Gibahappa, inhabited by just 16 families, near capital city of Itanagar in Arunachal Pradesh. The village received electricity for the first time with the inauguration of a 14-unit solar home lighting system on Sunday. Capital Complex Deputy Commissioner Prince Dhawan the solar lighting system in the village, located approximately 10 km from the capital, which was sanctioned from the Deputy Commissioner’s untied fund. The project was executed by the Arunachal Pradesh Energy Development Agency (APEDA). After inaugurating the system, Dhawan expressed his awe that a village located just 10 kms away from the capital does not have grid power connection, and assured to look into the matter. He also endorsed the request placed by the All Lorr Bath Youth Association for construction of a concrete footpath from Lorr village to Giba village. 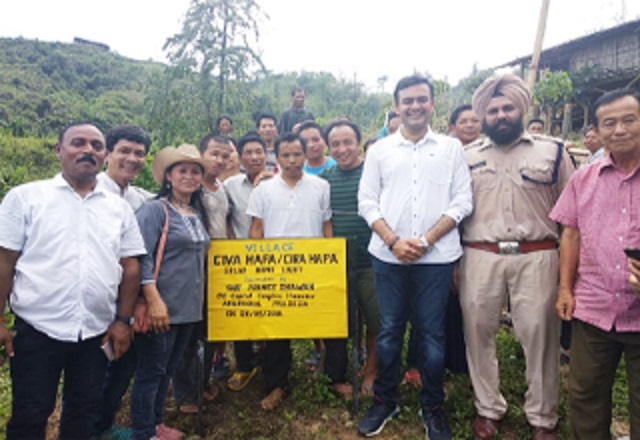 Interacting with the villagers, the Deputy Commissioner advised them to focus on developing the area as an adventure tourism spot, exploring its beautiful landscape and proximity to the capital. The Deputy Commissioner was accompanied by Superintendent of Police, Sagar Singh Khalsi, ASM Teli Yamang, and APEDA JE Likha Papu. The team reached the village after a six-kilometre hike on foot from the entrance of the zoological park. Earlier, the Deputy Commissioner inspected the primary school in Lor-Putung, where safety fencing and toilets were constructed for school children. The safety fencing and other electrical items, such as fans and lighting system, were also sanctioned from the Deputy Commissioner’s untied fund, 2017-18.